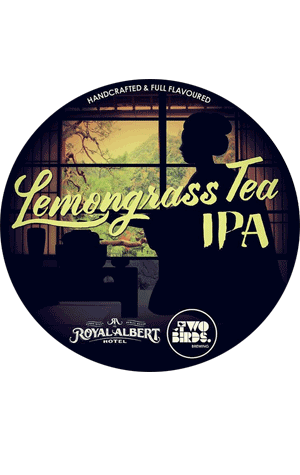 For the second collaboration in the pub's history, the team from the Royal Albert Hotel was invited to travel down to the Two Birds Nest in Melbourne for a brew day and the product of their collective toil is a Lemongrass Tea IPA. The beer is an appropriate ode to Spring: a celebration of things emerging from months in the dark which suddenly burst into the light bringing colour, flavour, joy and life. Perhaps the most important detail to grasp from the off is that this beer was infused with lemongrass as a tea, as opposed to lemongrass and tea. That means things lean towards the citrus character and there’s deliberately little in the way of astringency or tannins, characters you might expect when seeing word ‘tea’ in the title. Around three kilos worth of lemongrass, sourced from Single Origin, were added to the kettle and fermenter for its zesty character. Seeing as few do tea as theatre as well as the Japanese, it’s only right that that country’s famous – or perhaps famously polarising – Sorachi Ace hop (albeit US grown in this case) was thrown in to further build up the lemony notes. Those were on top of the New Zealand hop varieties Waimea and Dr Rudi which add complementary fruit characters including tangerine, orange and grapefruit. This beer is assuredly an IPA but one that comes with a relatively mild bitterness and a degree of quaffability you might expect from something lighter – to the point where this 6.4 percent ABV brew could put you in a spot of bother such is the ease with which it goes down.